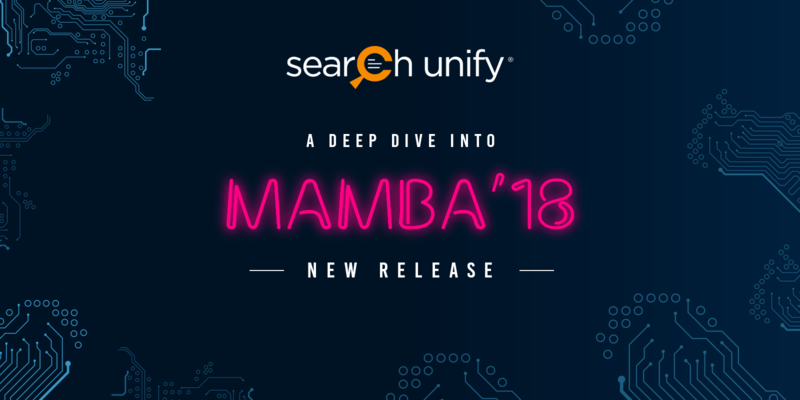 Okay, here comes the news that we’ve been eagerly waiting to share – we have successfully rolled out the biggest and most anticipated release of the year – Mamba! This release brings in a whole array of new features and upgrades, and this blog post gives you a sneak peek into them. Without further ado, let’s get to it! Chatbots : This is probably the biggest highlight of Mamba. While chatbots are not new, our AI-powered chatbots (which we like to call SmartBots) have a few tricks up their sleeves that help them stand out from the rest of the bots. Machine learning helps them to continuously improve themselves. Not just that, they are also capable of building their own intent dictionary, responses, and conversation stories. If there is something like a fully-automated customer interaction system, this is as real as it can be. Automated Synonym Factory : Bygone is the era when admins had to tirelessly compile a list of synonyms and constantly update them. Now let Mamba take care of it. It analyzes user queries and conversion to generate its own list of synonyms. All you need to do is simply manage the recommendations by accepting or rejecting the suggestions. Agent Helper : In support channels and clients (like Service Cloud & ServiceNow), SearchUnify can help your service representatives quickly respond. To achieve this feat, it first analyzes historical responses to similar cases and then suggests responses accordingly. Semantic Knowledge Graph : SearchUnify not only delivers apt information that the user seeks but also all the relevant knowledge related to the query at one place. This makes your search client an all-inclusive, power-packed source of knowledge for all users. Go Hybrid With On-Premises Indices : Get the best of the flexibility of cloud with the security of an on-premises index. You can now host your entire SearchUnify index on your servers. Simply install the on-premises add-on and activate. IP-based Access Control : Prevent unauthorized users from accessing your SearchUnify services, e.g. Console or REST APIs. This new feature allows you to whitelist only the IP addresses you use, everyone else trying to access the services will receive an error message. Enhance Security with Timeout : How long should an idle session last? The new Timeout lets you decide. You can specify the maximum time before SearchUnify automatically starts a new session. It really helps you get better case deflection reporting. In a bid towards supporting every enterprise platform under the sun, we have added a slew of content sources so that you can create a bigger pool of information and effectively educate your users. Dropbox : Don’t let all the data stored in Dropbox rot away. Put it to good use by making it available to your support engineers, success managers, and marketing executives by adding it to SearchUnify index. Moodle : After putting all those efforts in developing ‘training wheels’ content, make sure your employees/users can actually reap its benefits. Let them educate themselves with your institutional knowledge bank. ServiceNow : Help your support agents to search incidents, knowledgebase, discussion from ServiceNow in any platform supported by SearchUnify. MindTouch : By aligning MindTouch with SearchUnify, your technical writers can see how well their persona-based content fares in the real world. They can identify high impact pieces and analyze the reasons behind their stellar performance. SOLR : For companies using their own SOLR index or insulation for in-house information like mailing lists, shared folders etc. 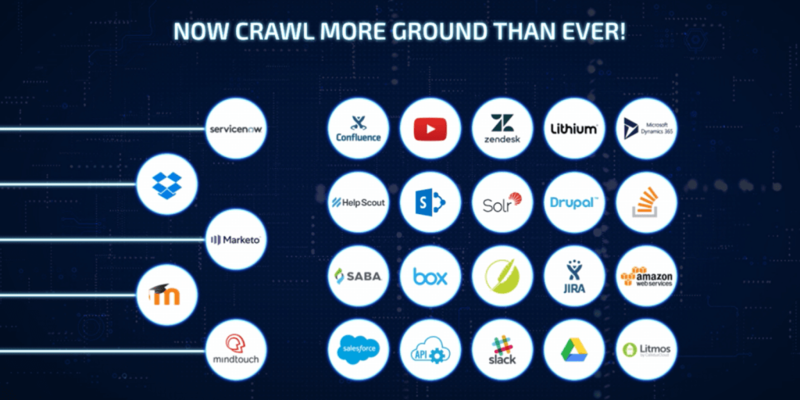 on their intranet, SearchUnify can now tap on this underutilized knowledge bank and make it searchable on supported platforms. Marketo : Forget the good old tab hopping and incessant Marketo logins. Now SearchUnify will help your success managers and sales executives see the entire Lead Activity History stored in Marketo along with complete user journey from website to support portal for a better understanding of prospects’ or customers’ state of mind. Time to cash in on the power of retention! Microsoft Dynamics : Bring down the turnaround time of your service representatives by giving them direct access to every helpful content piece from your unified knowledge architecture within Dynamics. Speedy resolution of queries helps improve CSAT. Drupal (7 and 8) & WordPress : Time to transform your website into a goldmine of customer insights. Use your CMS to unlock complete user journeys and identify what users search for and which pieces drive more conversions. This helps in optimizing information delivery. 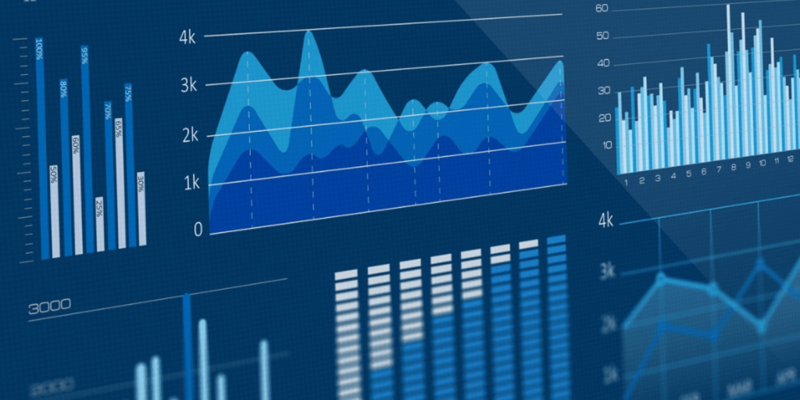 Analytics has always been one of our leading differentiators. With the launch of Mamba, we aim to take it even further. We have completely overhauled the reports so that you can make the most of your search data. The ‘Overview’ tab delivers variety of reports such as recent searches, conversions, churn, etc. in one window. ‘Conversions’ tab helps you paint a clearer picture of search success with reports on session analytics, case deflection, etc. ‘Content Gap Analysis’ reveal engagement driving content as well as gaps in your knowledge base content. As you open your SearchUnify instance, you are greeted by a vast and fully-customizable dashboard. That is not the end of it. You can go on and customize your own dashboard by choosing from over 20 reports. On top of that, report-level filters enable you to further drill down on reports basis search client or time span. In our bid to offer maximum flexibility to the users, Mamba takes the total number of out-of-the-box APIs to three: Analytics, Search, and Content with search API and content API being the latest additions. Mamba has polished the layout for results displayed within the Salesforce console. We have optimized the solution for better utilization of real estate to facilitate better user experience and ease case resolution while using Salesforce Service Cloud. Since SearchUnify now bundles a whole array of reports and features, we’ve made it convenient for the admin to locate an item of interest. There’s an interactive search embedded in the solution that straightaway leads you to the interest item. To put it simply, Mamba ‘18 brings a slew of changes which take the console to a whole new level. It introduces a number of big-ticket enhancements along with many handy improvements which enhance usability, facilitate decision making, and contribute towards a more fluid user experience. The features listed here are just the tip of the iceberg. To experience the beefed-up SearchUnify, request a free demo now.